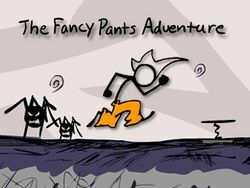 The Fancy Pants Adventures is a series of platformer flash games by Brad Borne, featuring the character Fancy Pants Man. Worlds 1 and 2 have been released and World 3 is in planning. The console version includes Worlds 1 and 2 as well as some all new levels. World 1 features spiders, thingy with a gun, and a Sleepy Penguin for enemies. This page was last edited on 31 May 2011, at 00:56. This page has been accessed 7,894 times.